Front Suspension Ø38 mm Telescopic forks 130mm wheel travel. 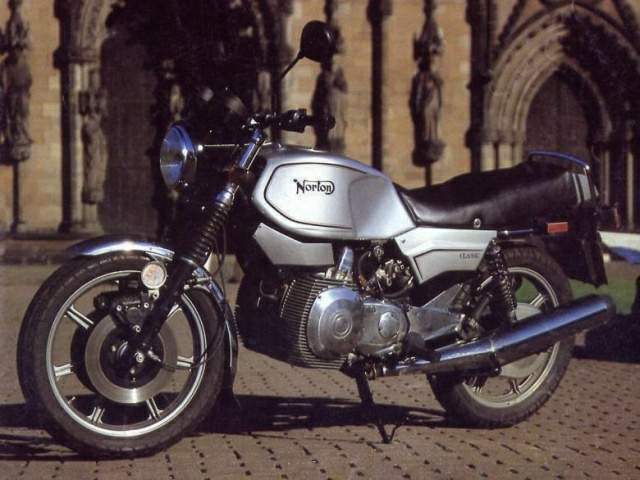 Only an earlier Rotary, Suzuki's calamitous RE5 or Hercules' own, but rather wimpish Wankel, can prepare you for a ride on the Norton Rotary. While its controls are virtually the same as those of any conventionally-engined bike, the manner in which it responds to them is most certainly not. From cold, the big (and ugly) 38mm SU constant vacuum carbs require a decent wodge of choke, courtesy of the dash-mounted knob, and the engine runs a tad rough until it's had a few minutes to warm up. Although rough in the case of the Wankel never means that it oscillates in an intemperate fashion, it just means it sounds a bit weird - and splutters. When you've got beyond that, tickover settles down to an impressive 500rpm or so, and after you've utilised the light and extremely progressive multiplate clutch to snick into bottom gear, you can pull away cleanly just 500rpm further up the chimney. 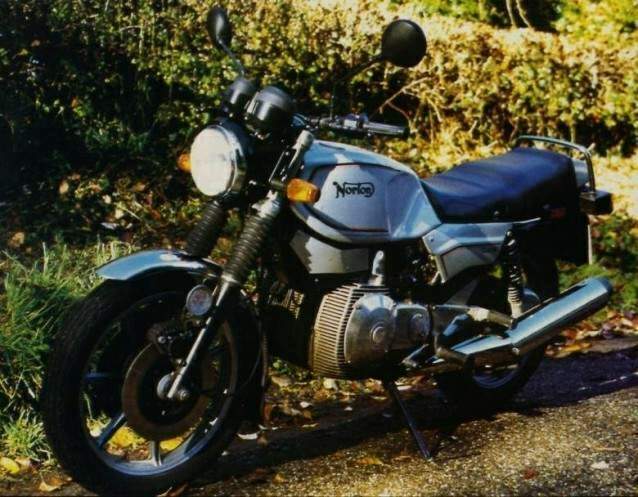 Suspicions that the two-stroke analogies of the rotary principle might mean a narrow powerband are quickly dispelled, for this package pulls from around 1500rpm and 20mph in top gear, almost right up to its 9000rpm maximum power point. At least in its top-of the-range 9:1 compression trim. 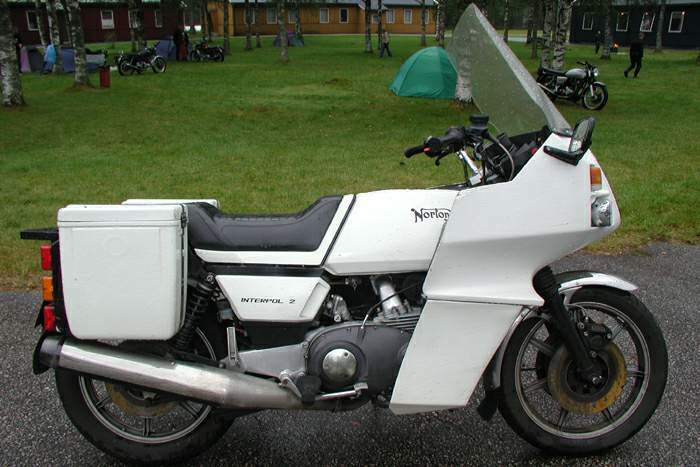 The liquid-cooled version I rode (not the air-cooled one in the pix), was burdened with a 500lb-weight of police-spec fairing and other law enforcement encumbrances which prevented it from travelling beyond 120mph - or at least without feeling distinctly wobbly. But with an indicated 17mph per 1000rpm in top, and 90mph at a leisurely 6000rpm on the same cog (and we're talking police calibrated speedo here), I assume that an ultimate velocity of 140mph is not beyond the bounds of reason. And considering that the Wankel displaces 588cc, that makes it a very nippy middleweight twin, no?! The bounds of reason are, thankfully, fettered by an electronic rev-limiter which restores sanity at 10,000rpm and an electronic CDI ignition fed by two 12-volt coils. A feature of the ignition is an electronic retard unit incorporating an electronic temperature sensor to optimise combustion efficiency. This is further enhanced by the engine's cooling system which draws filtered air through the frame and fins to the bowels of the engine before it reaches the SUs. Except on the liquid-cooled engines, where it doesn't. In operation, of course, the engine is extremely smooth and mechanically quiet - hence the need for the rev limiter. In these respects riding the rotor-cycle is really an uncannily different experience, and ultimately a very pleasant one, for the exhaust note compensates for unfamiliar engine feedback with a rewardingly fulsome roar - although even that is like nothing else I can readily bestow cliches on. With only an afternoon on the bike, I clearly can't report comprehensively on the riding experience, but despite the Plod-like accoutrements, and stiffish suspension and seat, I can confirm that it's a supremely fatigue-free deal. Unfortunately I did have some problems with the handling, though. On slowish corners I found understeer up to the apex of the bend quickly giving way to oversteer thereafter. This was a bit disconcerting, and required a certain mental preparation when negotiating tight twisties, but the problem disappeared beyond about 55/60mph when the steering became pretty neutral, although erring slightly to oversteer as per the current fashion. Some of this might be down to the heavy fairing; Dave Evans told me that spacers of 1 to 1.75in are inserted above the fork springs to suit personal tastes, as rake and trail measurements of 28°mm/127mm respectively, should make for the aforementioned neutrality in almost all conditions. out of trouble. Lever pressure is fairly minimal and sensitivity fairly good, but the rear brake seemed to be suffering from that stodgy, rather inert feeling that you sometimes get with the Italian retardants. Tyres on my test bike were Avon Super Venoms, 120/90 rear and 100/80 x 18, front, and proved suitably sticky even in patchy, wet 'n' dry conditions. It wasn't until I voiced my concern on the handling and phoned Mr Denniss to check tyre pressures that I discovered the front cover was running 7psi below par, which probably explains everything.